In time for the 75th anniversary of the Battle of Britain, we now have—thanks to Swedish historian Bergström—perhaps the most thorough, expert examination of the topic ever written. Illustrated throughout with maps and rare photos, plus a color section closely depicting the aircraft, this work lays out the battle as seldom seen before. In time for the 75th anniversary of the Battle of Britain, we now have—thanks to Swedish historian Bergström—perhaps the most thorough, expert examination of the topic ever written. Illustrated throughout with maps and rare photos, plus a color section closely depicting the aircraft, this work lays out the battle as seldom seen before. The battle was a turning in point in military history, and arguably in the fate of the world. By late summer 1940 Nazi Germany had conquered all its opponents on the continent, including the British Army itself, which was forced to scramble back aboard small boats to its shores. With a Non-Aggression Pact with the Soviet Union in hand, Hitler had only one remaining object that season—the British Isles themselves. However, before he could invade, his Luftwaffe needed to wipe the Royal Air Force from the skies. Thus took place history’s first strategic military campaign conducted in the air alone. This book contains a large number of dramatic eyewitness accounts, even as it reveals new facts that will alter perception of the battle in the public’s eyes. For example, the twin-engined Messerschmitt Bf 110 was actually a good day fighter, and it performed at least as well in this role as the Bf 109 during the battle. The Luftwaffe’s commander, Hermann Göring, performed far better than has previously been his image. The British night bombers played a more decisive role than previously thought; meantime this book disproves that the German 109 pilots were in any way superior to their Hurricane or Spitfire counterparts. The author has made a detailed search into the loss records for both sides, and provides statistics that will raise more than one eyebrow. The “revisionist” version, according to which the courage and skill of the RAF airmen is “exaggerated” is scrutinized and completely shattered. There is no doubt that it was the unparalleled efforts of “The Few” that won the battle. The Germans, on the other hand, did not show the same stamina as they had on the continent. The following summer they would show it again when they went in to Russia. In the skies over Britain this work verifies where credit was due. 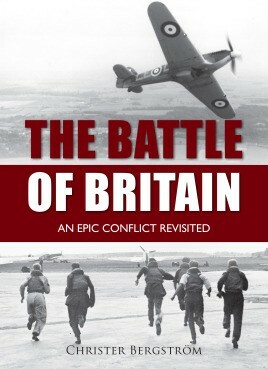 This is a wide-ranging book looking at all aspects of the battle and brings it together in a single attractive package. The book promises rarely seen images and while there are many old favourites I noted a good number I had not seen previously. It looks good and feels substantial. … Mr Bergstrom gives a good account of it and if you are looking for an image heavy one-stop history this might be all you need.